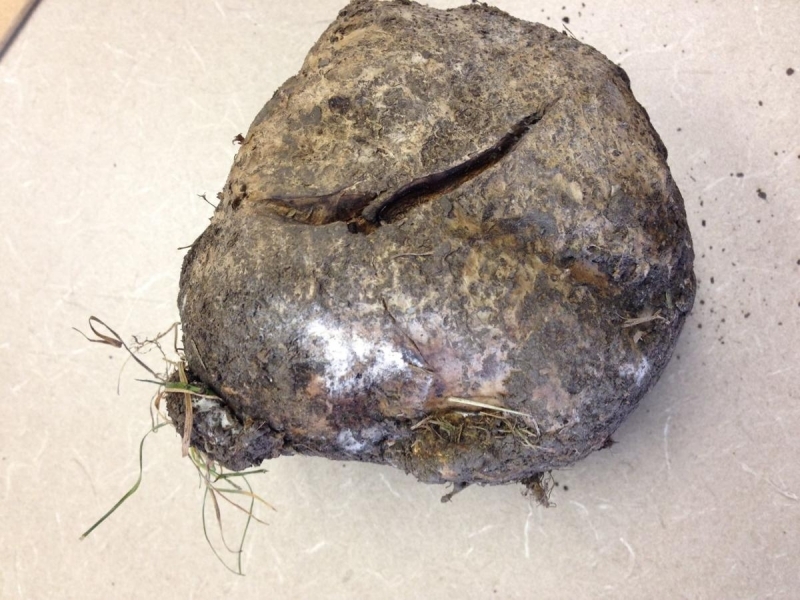 Last week, a client brought in a large white fungal orb that she had dug out of her grandson’s lawn. It was the type of fungi a mushroom hunter may rejoice over finding, but this woman and her grandson considered it troublesome as it made it difficult to mow. There are many varieties of what was diagnosed as puffball mushrooms. Some are smaller and some larger, some pure white and some dirty brown. This one was dense, as big as a grapefruit, covered in soil, and was part of a colony. These puffballs are helpful to rot wood and are located where there may be buried pieces of wood, stumps, excess thatch (dead grass) or dead tree roots. They are doing what mushrooms do: decompose organic matter. Most of these fungi feed on this organic matter, breaking it down and recycling nutrients for other plants. Although these organisms cause much concern, they do not take nutrients from the plant material but make them more available to plants. They appear when the temperatures and moisture are just right and that is apparently after our recent rains. The large white fungal orb is known as a fruiting body, as opposed to the mycelium. (The mycelium is the vegetative part of the fungus consisting of white filaments known as hyphae, which may remind a gardener of roots.) When they are considered ripe (right temperature and moisture), they burst open and release microscopic spores that are spread by water, wind and tools. The mushroom may present itself as a toadstool, stinkhorn, and inky cap, or be like most fungal turf problems that are virtually unnoticeable (like fairy rings). They may or may not have fruiting bodies like puffballs, and are an issue in spring. If excessive (more than half-inch) thatch is present, de-thatch in the early autumn or spring and determine why thatch accumulation is present. Aeration will control thatch and allow water to penetrate into the root zone, stimulating more grass to grow. once organic matter is used up, they will disappear naturally. Fungi can survive in your yard for several years as they wait for the right time to regrow and create more spores.